Yesterday was Pancake Day. So, I decided to make waffles for supper! 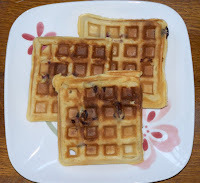 :) I had some blueberries in the fridge, so they became Blueberry Waffles. Yum! I beat the eggs, then added the milk and oil. Then the dry ingredients. I did have to add a little extra flour. (The original recipe only called for 8 c. flour. I think I ended up with 10 - you may have to add another cup of white rice flour.) Then I added the blueberries. The batter should be a little thicker than pancake batter. Cook according to your manufacturer's instructions. Tyler and I had banana muffins last night instead of pancakes. I didn't even know it was pancake day until I read your email! ha! Next year I'll be prepared. MMMmmmmm Waffles!!! They look awesome!! But I don't know if I believe that they actually WERE that good. So, to prove me wrong, you could bring a sample (read at least 2) on Friday.